“Art Centres need to consider regulating the number of art products that are released on to the market, critically assessing the price points of their art products, and marketing them appropriately”. Those are the critical conclusions of a series of recent reports by the Alice Springs-based Ninti One, the Cooperative Research Centre for Remote Economic Participation, whose mandate is to suggest solutions to the economic challenges of remote Australia. 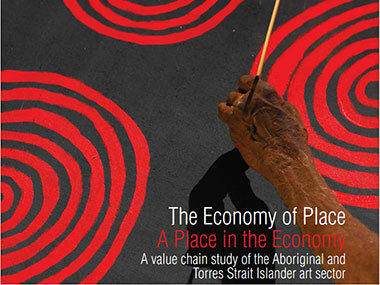 'The Economy of Place : A Place in the Economy' – as the summary report is neatly entitled – begins much more positively. The Indigenous art sector is vital to Australia in many ways, it assures readers: there's the identity it gives all of us us as the place in the world with the longest continuing human culture; it's evidence of a continuing Aboriginal presence and proof of the diversity of their cultures; and it's a distinctive and dynamic art movement. But the boom time is past – it's time to re-evaluate. And that's what Dr Alice Woodhead and Tim Acker have spent two years attempting to do; talking to more than 200 art centres, art businesses, agencies and individuals. Their efforts have gone into five reports and a summary, which are designed to enable change. And the figures that ought to disturb most suggest that since the earliest art centres came into being in the 1980s, almost 400,000 products have come out of them, though in the key 2003 to 2012 period for which they have the most accurate figures, 60,000 of them remain unsold. In particular, income peaked in the 2007 year (before the GFC changed everything) at $12.57m – but production kept climbing to a peak in 2010. Despite (or perhaps because of) that, 2012 art centre income was almost as bad as it had been in 2003 at $6.85m. Worst hit, too, were the most productive artists, those over 67 years of age. They create the big-priced items – mainly paintings - from their higher levels of experience, and their earnings dropped 52% at this time. Are there too many artists in too many art centres? 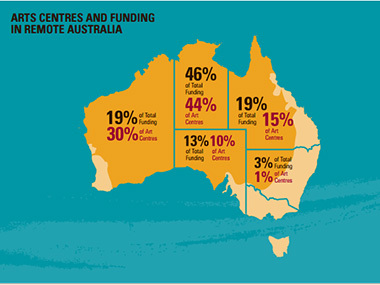 In 2012, almost 14,000 people call themselves artists amongst the remote (and Very Remote) Australian population of 60,000, operating out of 87 art centres. But there were only 61 of them in 2003. There are also 875 freelance artists – though I suspect their output in an area like the Eastern Desert (including the prolific Utopia artists who've always resisted having an art centre) simply can't have been counted. For one chart shows annual sales from Arnhemland art centres at $630,000 and from Western Desert art centres (where 78% of the population makes art!) at $590,000. Eastern Desert managed only $75,000 – hardly enough to keep even one of Alice Springs many dealers in business! However, the reports themselves offer the following caveat: “When reading this report it is important to remain cognisant of the response rate from Art Centres. The 2003–2007 data is based on data from 41% of the total operational Art Centres during that period. The 2008–2012 data is based on data from 51% of total operational Art Centres. It is not advisable to multiply the total sales by the percentage or number of missing Art Centres as there is considerable variation in the size and scale of production by different Art Centres. “After all this time, I'm still unsure it's possible to answer that beloved, but probably meaningless question about how 'big' the ATSI sector is. From our tallying of remote art centres total sales, over the last few years, they may be creeping up slowly into the low $30 millions. That's primary sales, and includes non-painting sales (merchandise etc), though that's only a small % of the total really”. The last few years have seen sales between $15 and $20m from those audits - those audits represent around 60% of all art centres. Accounting for the art centres whose records we don't have, but also making educated guesses on the sales and/or using some averages for their region suggests an additional $10-$12m p/a. So, I use $30m as an estimate - primarily as a way of putting some reality back into the perception of Aboriginal art as enormously lucrative business. That $30m is demonstrably important on a whole lot of levels, but it's a long way from the $200m etc figure that's been quoted. Auction sales have been around $10m p/a for the last six or seven years, but it seems an almighty stretch to imagine that the gallery/retail sector could be worth $160m a year when there are only around 120 outlets trading in ATSI art still in business. Funding for remote art centres has come in for criticism recently – with annual grants from Canberra totalling around $26.1m seen as bureaucratising this delicately balanced business. But with a 126% fall in retained earnings over the10 year survey period, 60% of art centres now get more from the government than they do from sales. Could this be related to the ending of CDEP payments to ancillary staff in art centres in 2009/10 and its replacement by the Indigenous Employment Initiative? For 57% of art centres now pay more in wages than artist fees – sometimes to the artists themselves. Remembering that one of Ninti One's proposals was developing ways of marketing the art produced appropriately brings us to the Indigenous Art Code. “While appreciated by many, (it) is considered to lack discrimination and focus. Respondents suggested that the Code could be better used in establishing standard provenance documentation”. For the un-standardised unpredictability of art centre documentation – often substituted by inauthentic documentation from the commercial outlet selling the art – is seen as a serious negative in a business that's afflicted with too many reports of faking and exploitation of artists. A final comment: “The majority of art businesses want greater support to develop new market opportunities and partnerships, and can see the advantages of improved cooperation and communication”. Well if the dedicated Ninti One can only get answers from 60% of art centres, it does suggest that the need to “improve connections between artists, agents and audiences” should be prioritised. Which made me think Adelaide's brave Tarnanthi Festival definitely needs to be repeated. BTW, 16 of the Festival's 24 shows are still on.